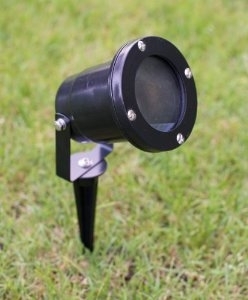 This weather-proof garden spotlight comes painted black, and constructed from aluminium so will not rust, with a glass lens and rubber weather-seals. Conforms to CE standards and IP44 approved for outdoor use. Ground spike is 170mm long, lamp is 180mm tall and 150mm wide. Each light also has a ground spike and a fitting to screw to a flat surface such as decking etc. Requires wiring, preferably by a trained electrician.